May 17, 2016. 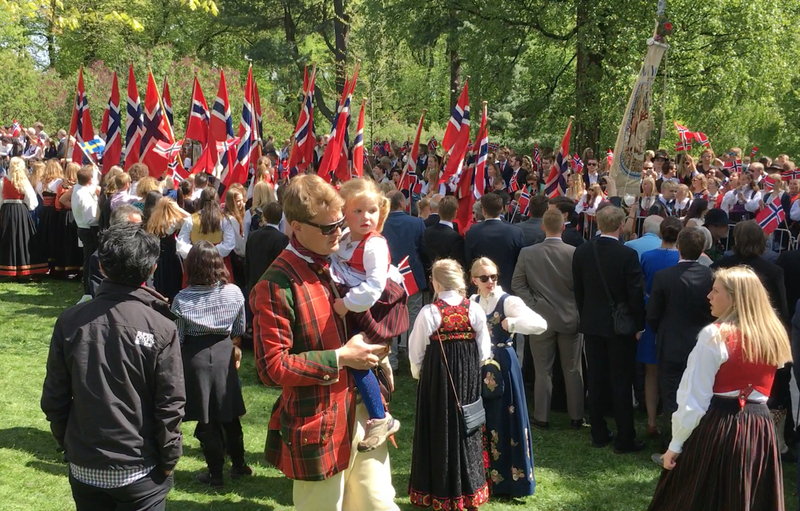 I don’t think Matthew and I will ever get tired of the celebrations surrounding Norway’s National Day. It’s like the 4th of July on steroids. The entire country dons traditional costumes and pours outdoors to wave flags, sing songs, join parades, and party the night away. So when a conference in Chicago threatened to make us miss the festivities, we pulled some serious airport acrobatics to arrive back in Oslo on time. 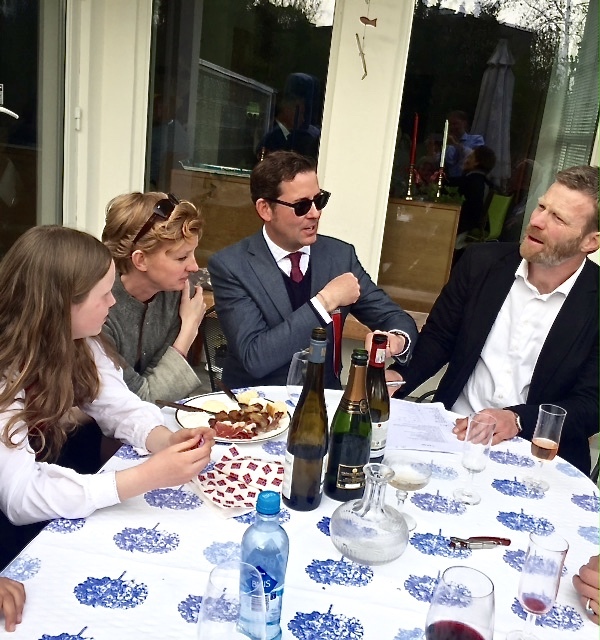 Especially because, this year, we had the added incentive of an invitation to a traditional National Day party at a Norwegian friend’s house. I’m wearing my red-and-blue tartan plaid, the closest I can get to a bunad. A series of grueling flights had left us with only a few hours to drool on our pillows before dressing up for the day’s events. Needless to say, we awoke groggy and jet lagged after being jarred awake by the sounds of a marching band passing by our building. We frenziedly tossed on our holiday red-white-and-blue and hurried outside to chase after other late-comer Norwegians, who’d clearly started their revelries the night before and were just making their way to the parade. Check out these cool Sami bunad from Norway’s Arctic Circle. Bunader (the plural of bunad) reflect the ancestry of the wearer. 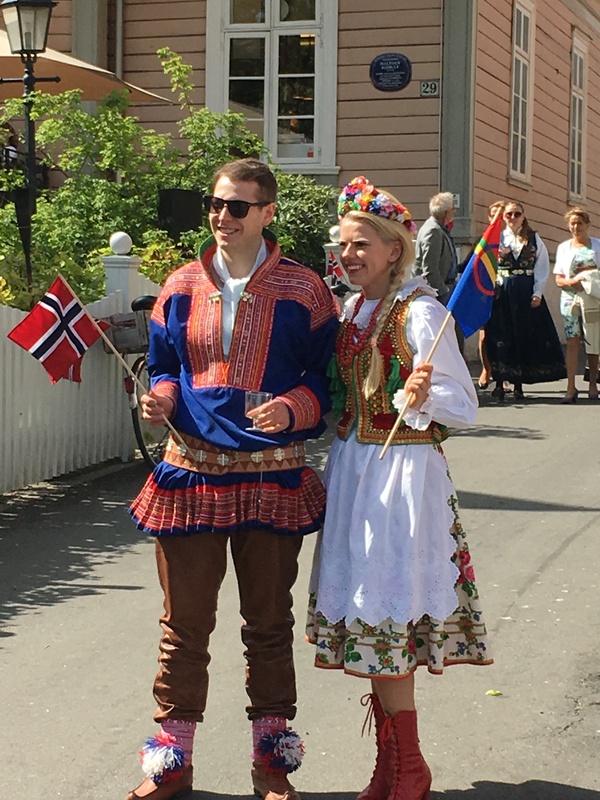 I think the woman on the left is sporting a bunad from Hardanger, while the woman on the right shows off a Gudbrandsdalen bunad. I’m still learning the various designs, but I think this handsome couple are wearing bunader from Telemark. Check out this awesome frock coat. It’s perfectly acceptable to wear a suit and tie — along with the requisite red-white-and-blue badge — if you don’t have a frock coat. I think the gentleman’s wife is wearing a bunad from eastern Telemark. Note the red overalls in the background. These are high school seniors completing their month-long Russ initiation as part of graduation. Here, they’re handing out their “Russkort” (Russ cards — think of them like wacky business cards with photos and slogans.) Little kids collect and trade these like baseball cards. For more about Russ, see my National Day 2015 post. Note the key words “well behaved” — not easy to achieve when everyone gets pretty liquored up on National Day. 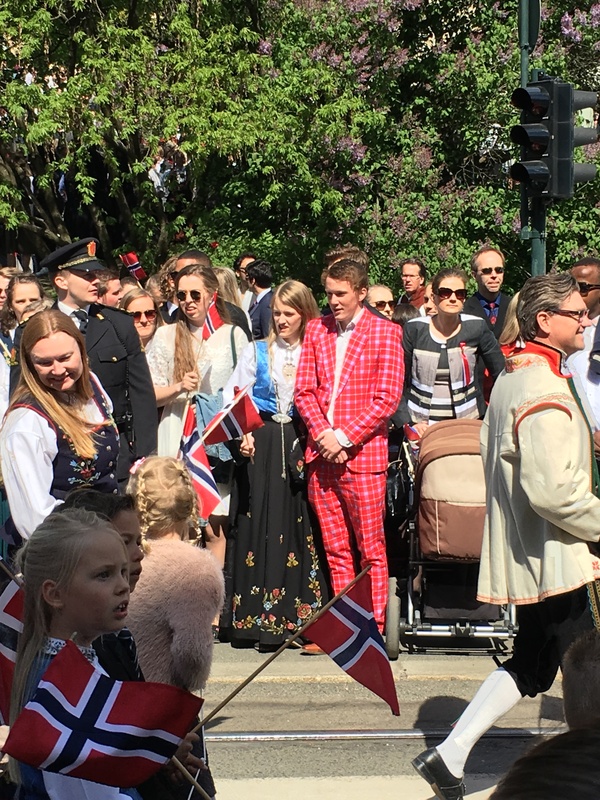 By the way, National Day is officially known as Syttende Mai (17th May) because that is the date the Norwegian Constitution was established. For more on the history of this holiday, see my National Day 2015 post. Taxis get in on the action by flying the Norwegian flag. Even the food shows national pride. Matthew sports the appropriate attire for the day, plus flags and a basket full of wine. Check out these little German kids in their lederhosen. Everybody pulls out their national costume for the holiday. This Scottish dude took the opportunity to show off his Celtic roots. And this Japanese lady displays both her original nationality and her adopted one. National Day really focuses on children, not on militaristic displays. Parents and kids set up booths to sell food and raise money for their school bands. Here, a group of school kids raises money for their school orchestra by performing in the park. A dad in a dapper National Day outfit escorts his daughter to watch the school groups parade by. We meandered through the mob for a while admiring the outfits, then parked ourselves in a sunny spot to watch the parade go by. Maybe it was the sunshine and reasonable temperatures (last year had been really cold and rainy, the year before incredibly hot), but folks seemed even more merry than usual. For the first time ever, we got to see some of the traditional dances, songs, and cheers associated with the holiday. One in particular involved everyone clapping faster and faster to a folk tune that ended with the entire bunad-clad crowd shouting “Hurra! Hurra! Hurra!” and then jumping straight up into the air, as if on pogo sticks. I have no idea what the performance was all about, but the antics were quite entertaining, nonetheless. The royal family waves from the balcony. 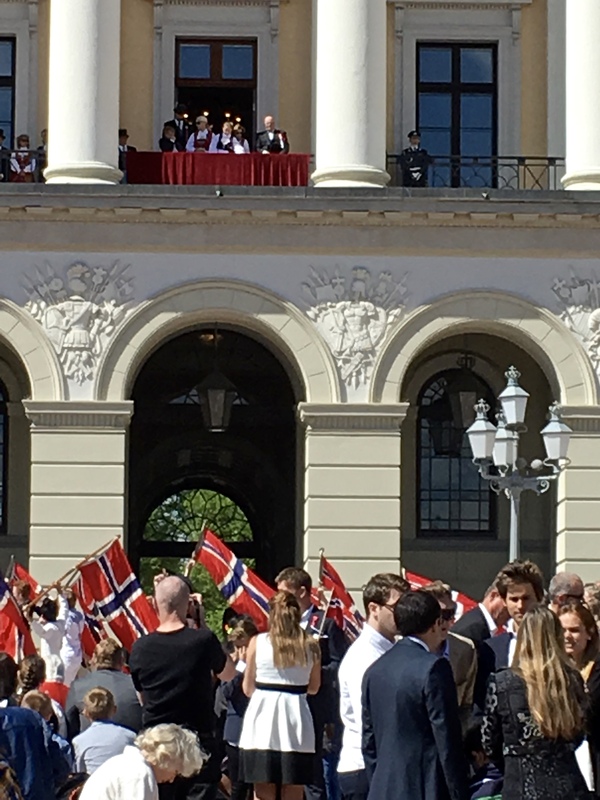 King Harald is on the far right — he’s just taken off his top hat to acknowledge the crowd. Click on the image for a bigger view. At the end of the parade, we swung by the palace to watch the royal family bestow their final blessings from the balcony. This involved the King, Queen, and Crown Prince and Princess walking to either end of the terrace and bowing before the crowd in thanks, while everyone whistled, clapped, and cheered their encouragement. A band then played “Ja, vi elsker dette landet (Yes, We Love This Country) as the singing and flag-waving throngs slowly made their way towards the park exits. I’ll miss seeing jaunty outfits like this one on National Day. The whole thing made us kind of misty as we realized that this might be our last National Day –although it seems our time here keeps getting extended, so you never know. 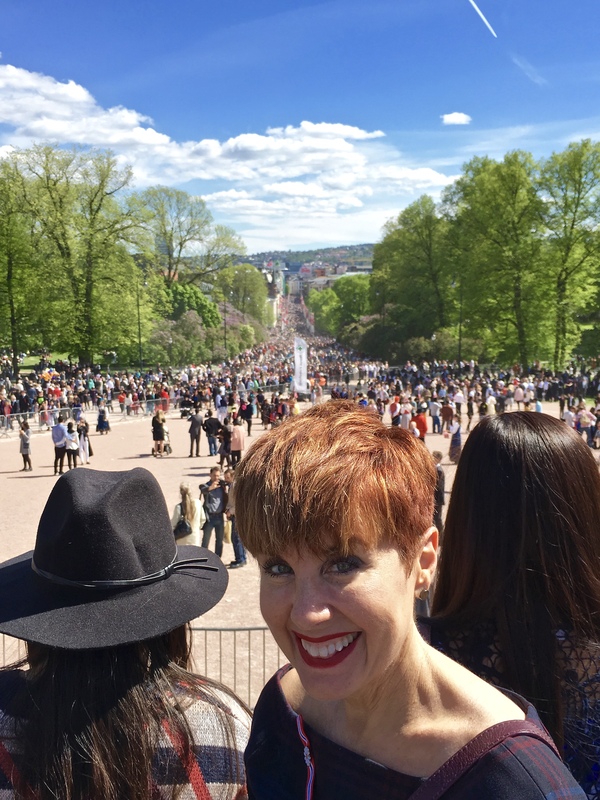 We do love our own 4th of July festivities back home, but somehow they seem just a bit tame after witnessing the pomp and circumstance associated with Norway’s celebration. So this year, we were particularly glad to extend our likely last National Day by visiting our Norwegian friend, Vidar, who was hosting a barbecue for the neighborhood. 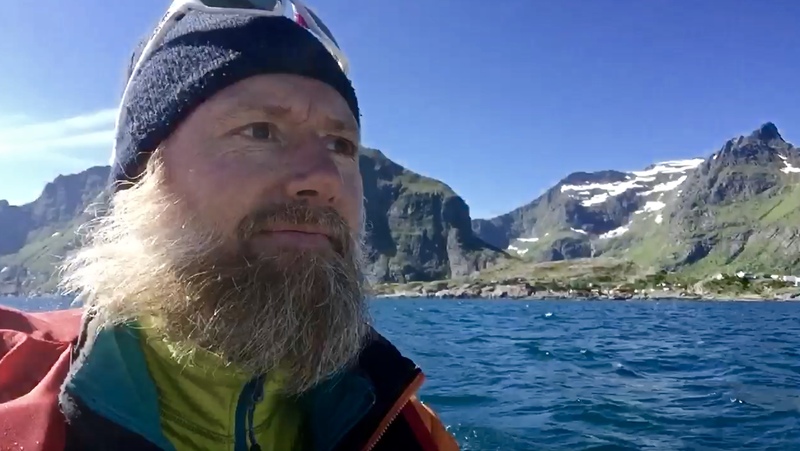 Vidar sent us a video of himself cruising in his new fishing boat along the shoreline of the Lofoten Islands in northern Norway. He’s a true adventurer. Let me give you a little background on Vidar. He’s climbed Mt. Everest, is an avid skier, and is known as Norway’s predominant pasta chef. (He studied pasta-making in Italy, and just appeared on a pilot program — hosted by famous Norwegian chef Eyvind Hellstrøm — in which home cooks attempt to impress celebrity judges with their culinary exploits.) Vidar now owns Club Maccaroni, the yummy café next to our jobsite, which is how we met him. Yeah, most Europeans jokingly compare Trump to Italy’s embarrassing ex-prime minister Berlusconi. 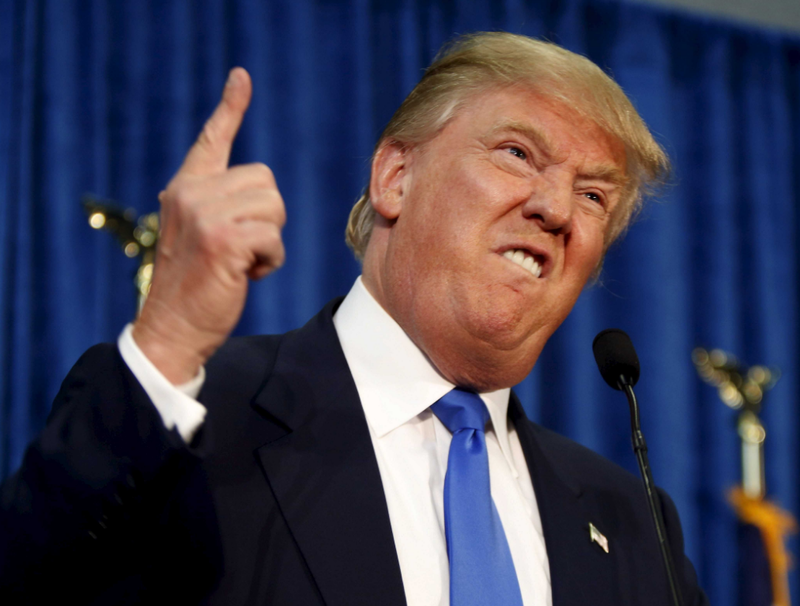 The impressions are that, aside from both being extreme bigots as well as spectacularly unqualified for their positions, they share oddly coiffed hair, questionable taste in women, and a Turret’s-syndrome-like diarrhea of the mouth that offends most everyone at some point, and is inadvisable in a world leader. We eventually ended up on the terrace, sipping champagne and sniffing the wonderful aroma of about fifty lamb chops sizzling away on Vidar’s American “Big Green Egg” grill. By the time we sat down to eat, we ourselves had been thoroughly grilled by a number of the guests, who were eager to understand how Donald Trump had made it so far in the presidential campaign race. I sure wish we had an decent answer to that question. I’m hoping it has more to do with his pure entertainment value as a bombastic reality TV personality than any true belief in his paranoid, xenophobic platform. Matthew looks a bit like The Godfather as he explains our odd American ways to puzzled guests at the party. The queries continued throughout dinner, following the usual outline. It seems that no matter where we go, Europeans express universal disbelief that, for such a wealthy, first-world nation like the U.S., the average citizen still: 1) pays out-of-pocket for a college education; 2) covers much of his/her own medical bills; 3) earns only two weeks of vacation a year; 4) does not collect a livable pension upon retirement; 5) owns a gun for “protection;” 6) possesses little knowledge of global events; 7) feels comfortable with the possibility of having a crass, unqualified, racist at the helm of the country. We try to debunk myths, explain the taxation issue, etc. But honestly, it’s difficult to justify why the U.S. is so far behind in what Europeans perceive to be basic human rights. Most people just look us with a bit of pity. It’s fairly rare to hear anyone complaining about income taxes here (which average 48% — VAT sales tax is 25%) because most folks are happy with the resulting benefits. In any case, it’s always a rousing discussion, and we’re quite aware that we’re often under scrutiny. There’s nothing quite like feeling the weight of responsibility for combatting “ugly, uneducated American” stereotypes, many of which can be sadly true, as we’ve personally witnessed while living abroad. Matthew orchestrates the construction of his team’s tower. “I modeled its engineering on the John Hancock Building,” he said. Hey buddy, it’s just a game. But back to the barbecue. Our political musings fell by the wayside when the games began. In the lineup was a cultural challenge — a trivia quiz about traditions related to National Day — followed by a test of dexterity and engineering. 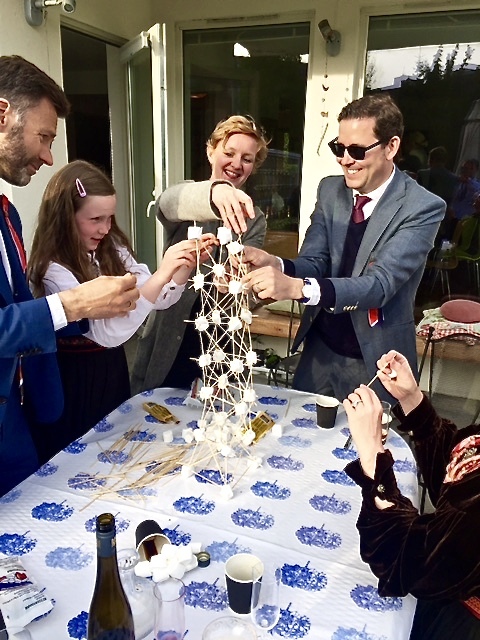 Teams were tasked with building a tower using wooden skewers and marshmallows; tallest wins the prize. With architect Matthew on board, guess which team won? I wish I had more photos to show you of the action, but I felt awkward about becoming the “picnic paparazzi” to feed my blog, so the photos here come directly from Vidar and Sophie. A statue of King Karl Johan looks down as the guards parade past the palace. A week later, we had the opportunity to experience one more National Day tradition. 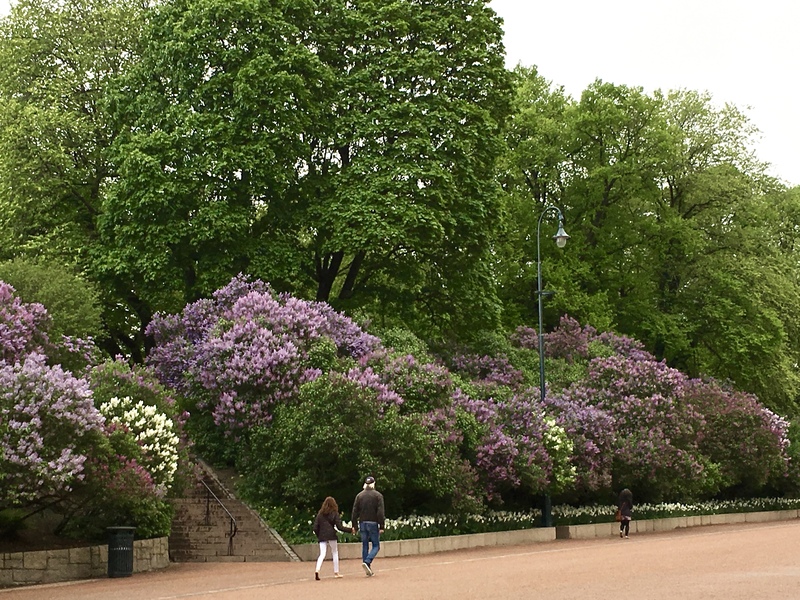 While walking through the palace park, we came upon a battalion of Royal Guards marching towards Karl Johans Gate. Gradually they peeled off, two by two, as they paraded down the street, with each pair of guards flanking one of the many flagpoles flying a Norwegian pennant. The commanding officer gave a whistle, and two coronet players trilled a fanfare while the guards methodically lowered the flags. 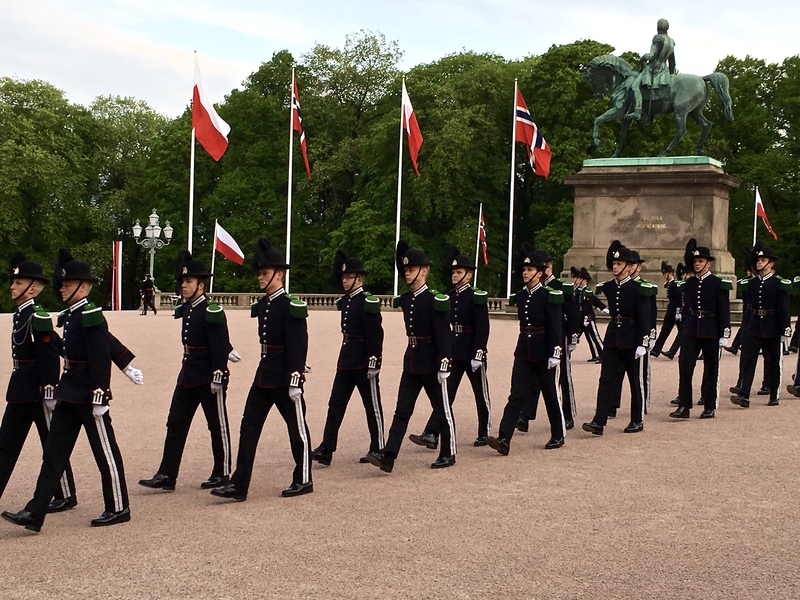 The guards line up, two by two, next to each flagpole, all the way down the palace grounds to Karl Johans Gate. I’m not sure why their hands are covering their faces. Maybe they’re hiding their whistles, or maybe they’re about to sneeze. Clearly, they’ve had a lot of training in how to properly pull down these flags. Check out how fastidiously these guys handle the flag pulls. I think I need one of those horsetail hats, by the way. Norwegians are serious about their flag protocol. There are rules about which version of the flag can be flow for different occasions, and how each must be handled. So it was a real trip to see some of this etiquette in action. And I’m hoping that with any luck, I’ll be able to witness a few more of these National Day traditions play out next year …..